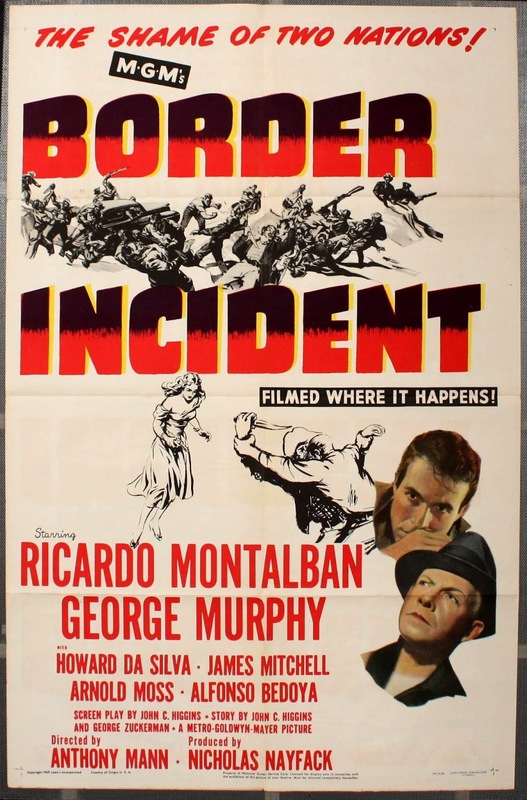 To combat the issue - Mexico sends in Pablo Rodriguez, their best (and handsomest) agent, played by Ricardo Montalbán, while the US sends Jack Bearnes (George Murphy) to assist. Rodriguez is to pose as a bracero, find out who is moving people through illegally, and Bearnes will tail him, his own cover as a guy on the run after stealing blank forms that will provide 1949-official documents for the workers, something he can sell and have an excuse to get close to the law-breakers on the US side. The film was made during a curious period in US/ Latin American relations as the US had initially sought cooperation for WWII activities via non-interference and boosterism of a certain fraternalness with anyone in the Western hemisphere that was, for a time, less patronizing and less CIA-meddling than it would become. Hollywood, not so far from the border, had already been romanticizing Mexico for a while, and the likes of Disney were happy to go much further South as ambassadors and to do research for propaganda (that eventually became Three Caballeros, which is a really weird movie*). In Hollywood, this era was maybe one of their greatest attempts to not just stick to the usual marginalization and stereotypes. By 1949 much of the effort had cooled, but it seems the efforts allowed for a "message picture" like Border Incident to highlight the situation on the border - try to explain the forces that cause/d illegal immigration, and how people work in the shadows on both sides of the border to exploit desperate people. The movie is surprisingly brutal, not shying away from some of the violence and dangers that thwart anyone crossing as you put your life in the hands of folks who will kill and dump you if you're a problem, and the kinds of violence they may be capable of in protecting their criminal fiefdoms. Even for a film that's part of a TCM series often featuring films about cold-blooded murderers, while mostly bloodless, the intensity is... unusual in an era still under the Hayes Code. The filmmakers had to seek INS assistance and approval in telling the story, and that much of what occurs in the film does defy era-expectations - that INS stamp of approval must have carried some weight of truth to what they were showing. Eddie Muller presented the film as a noir, so I'll let the tag stay - I'm not arguing with the man. But it's more of a pure thriller, in my book, and definitely a movie where you start grinding your molars as our two agents go into play, and because they don't know what they don't know - there's life threatening challenges at every turn. Shot in stark black and white by cinematographer John Alton, directed by Anthony Mann, the film takes place in border towns, dusty farms and the starkness of the California/ Mexican desert - creating some indelible imagery that, no doubt, is part of how the film gets counted among noir favorites. I've no bones to pick with George Murphy as the American agent. He's quite good, but Montalbán was well ahead of him in performance, and comes out on top as the star of the film, even when they have fairly even screentime. Montalbán was being given a great opportunity here, having already appeared in musicals and comedies, he was making the transition to dramatic actor, and the part is treated with the utmost sincerity within the film, even before he brought the character to life. Other favorites include Charles McGraw as a heavy, working for the big boss played by the always-terrific Howard Da Silva, here the brains of an operation that's shakier than he thinks. It's hard to ignore that other key actors in the movie playing Mexicans were actually Anglos - and that's something obviously fraught with issues then and now, but SOP in Hollywood until fairly recent days. Nonetheless, James Mitchell's Garcia is a sympathetic but strong-willed representation of who gets desperate enough to try an illegal crossing and why. Clearly the movie can't and doesn't take on every possible reason or person who comes to the US border, but it's fascinating to see a movie that shines a spotlight on an ongoing issue and feels so oddly modern and topical. While many of the crimes that take place in Noir Alley pictures are still around, our thinking on them has changed. On this topic, the movie could have been written and released in the past year - but I suppose it's an issue that's been in place since 1845 at least, and will be until something drastic changes all the forces at work. *it basically posits that the U.S. should definitely be friendly with Latin American nations because the women are terribly attractive. I'm not even really kidding. That was my take-away. Also, the Three Caballeros are funny - and I love them unapologetically.